Is there anything better than a breakfast of pancakes or waffles smothered with delicious maple syrup? Eager to try homemade maple syrup this year? Warmer days and chilly nights are the ideal conditions to get sap flowing from Ohio’s maple trees, and Malabar Farm State Park provides an excellent place to experience how maple syrup is made (and to sample some as well, of course). The Maple Syrup Festival, held continuously since 1977, continues Saturday in Sunday from 12 noon to 4 PM. This free festival is a great opportunity for families and friends to step back in time, learn, and enjoy the history of Ohio syrup making at Malabar Farm State Park. And hopefully the warmer weather will help promote the fun! The festival includes demonstrations of sugaring techniques from the early days, when Ohio was home to Native Americans, through present day. 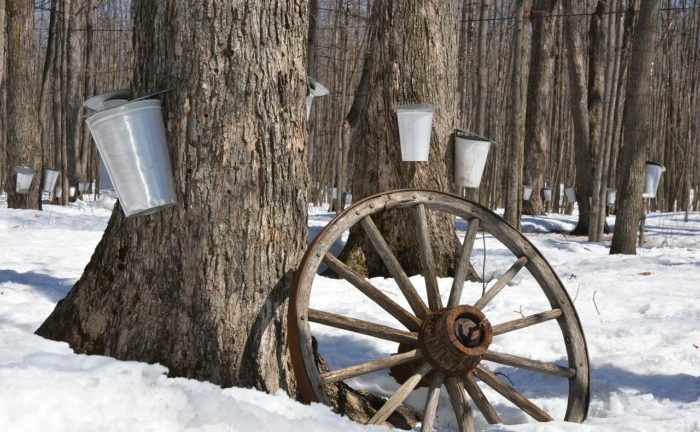 A self-guided tour of the sugar camp and sugarhouse will reveal the evolution of sugaring equipment and how maple sap is transformed into maple syrup. A peek inside the summer bell house, behind the Pugh Log Cabin, will take you back to Ohio’s past. Kids and adults will also enjoy the horse-drawn wagon rides to the sugar camp provided by the Central Ohio Draft Horse Association. Free samples of maple syrup will be available at the sugar house. Pure Ohio maple syrup, homemade Maple Walnut Fudge, Maple Cotton Candy, Maple Popcorn, and other maple products will be on sale during the event, and in the Malabar Farm Gift Shop throughout the season. Live musical entertainment will be provided along with light refreshments and snacks during the festival in the Pugh Log Cabin located near the event. Bromfield’s 32-room mansion will be open for hosted, self-paced tours from 12 noon to 4 PM . Tickets can be purchased in the Gift Shop. For more information on maple syrup in Ohio, including a video on how to tap a tree, go to parks.ohiodnr.gov/maplesyrup. For a complete list of Richland County attractions and events during March, visit www.destinationmansfield.com.